The male Hairy Woodpecker was photographed at the Wehr Nature Center in Milwaukee, Wisconsin. The female Hairy Woodpecker was photographed at the Bong State Recreational Area in Kansasville, Wisconsin. 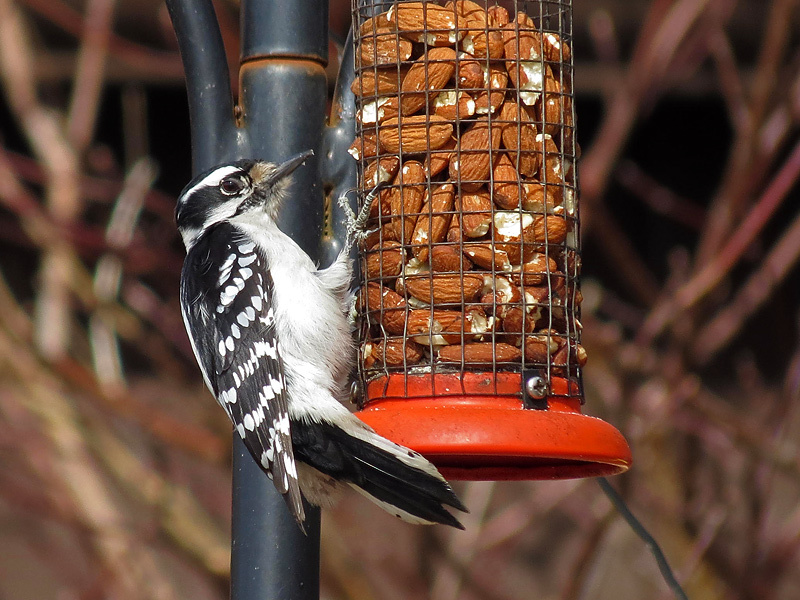 The Hairy Woodpecker are checkered and spotted with black and white and a white back, breast and undersides. The male has a small red patch on the back of the head. The Hairy is like a large Downy and it has a bill larger in comparison to the Downy’s. 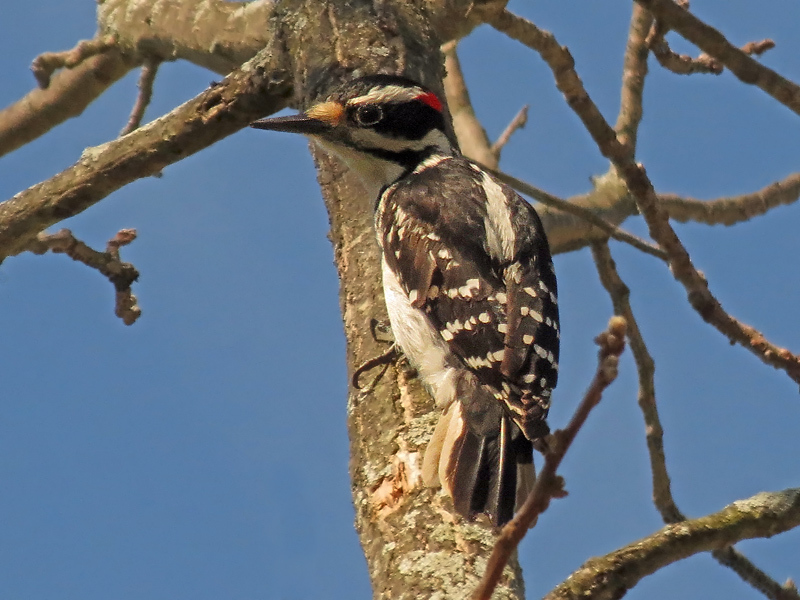 The Hairy and Downy Woodpeckers are the only Woodpeckers with a white back. It has a range from Alaska and Canada to Panama. It has a habitat of forests, woodlands, river groves, and large shade trees. It feeds mostly on seeds and insects. It is less common and likely to show up in suburbs and city parks. The female Pine Siskin was photographed with the male at Bong SRA. It has a duller appearance than the male. The Pine Siskin is a small, brownish, heavily streaked finch with a deeply notched tail, and sharply pointed bill. Usually shows a touch of yellow in the wings and base of tail. They have a Range from southern Canada to southern United States. The Pine Siskin has a habitat in conifers, mixed woods, alders, and weedy areas. They feed on thistles and sunflowers, and feeders. They are very similar to the American Goldfinch. They usually roam in twittering flocks and descend on fields of thistles and wild sunflowers. 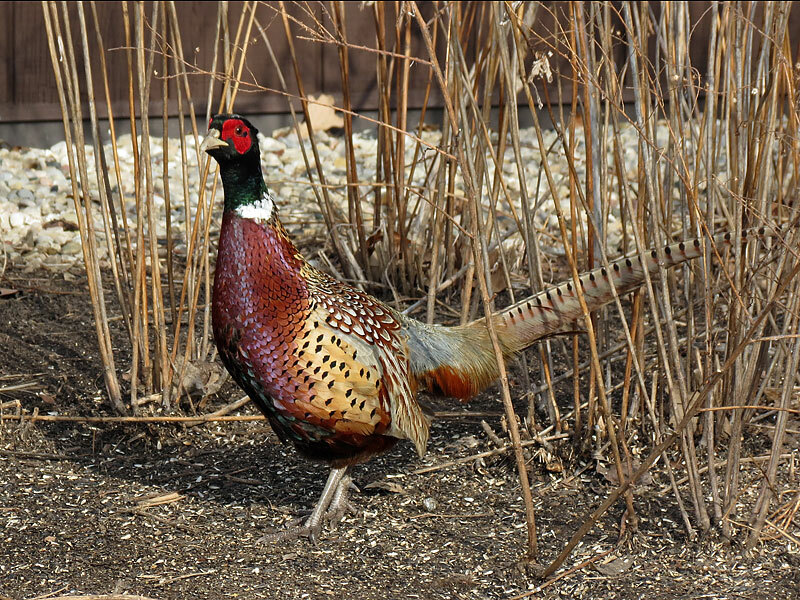 The Ring-Necked Pheasant was photographed at the Bong State Recreational Area in Kansasville, Wisconsin. A large highly colored and iridescent gamecock-like bird with a long sweeping pointed tail, scarlet waffles on its face, and a white neck-ring. It is a shy bird and runs swiftly, and has a strong flight and noisy takeoff. It was introduced from Asia as a game bird. It thrives in some areas, such as northern prairies. Flocks of these pheasants often are segregated into small groups of males, and larger flocks of females. It ranges widely in North America. It has a habitat at farms, fields, marsh edges, and brush. It feeds on a wide variety of grains and small seeds, green shoots, buds, roots, berries, insects, spiders, earthworms, etc. Typically feeds on the ground scratching and digging with the feet. This Eurasian Greenfinch is an accidental US bird commonly known in the Europrean UK. It was photographed at the Bong State Recreational Area in Kansasville, Wisconsin. The Eurasian Greenfinch is an olive-green bird common to the European UK. It has a powerful conical bill for eating large nuts. It’s found in the garden and countryside of the UK. It is not certain if the origin of the bird is of wild origin, an escapee, or released from captivity in the US. 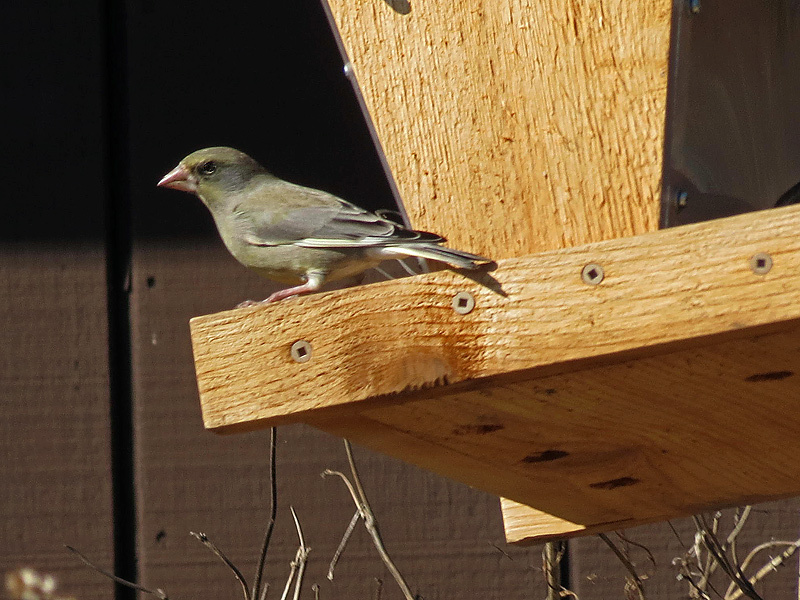 Only one Eurasian Greenfinch was seen at the Bong State Recreational Area in Kansasville, Wisconsin. The Common Redpoll is a streaked gray-brown finch with a black chin, dark streaks on the flanks, and a bright red cap. The male is pink breasted and the female not. Its range is northern Canada and Alaska and wintering irregularly in the northern and central United States. The habitat is birches, evergreens, and tundra scrub, and in winter weeds and brush. They actively feed on seeds from trees and weeds. Their flocks are seemly always on the move. I specifically went to the Bong State Recreation Area in Kansasville, Wisconsin to find and photograph the Common Redpoll. I had struck out several times before and also at other locations where they had been seen. It was reported as seen around evergreen trees eating the berries at Bong. Upon arrival at the Bong entrance I met other Milwaukee birders who stated the Redpoll was seen at the evergreens and the bird feeders, but was not regular-good luck on finding them. I went to the bird feeders. On the first and second try at the feeders no Redpolls were seen. I asked other birders and they stated they had seen them around the evergreen tree areas. I walked by the evergreen trees at several areas, and heard birds but saw none. I tried a phishing call but nothing came out. I went back to the bird feeders and saw House Finches, American Goldfinches, Downy Woodpeckers, Northern Cardinals, White Breasted Nuthatches, Ring-necked Pheasant, and American Tree Sparrows. Several Redwing Blackbirds flocked in and chased the birds at the feeders away. Upon getting ready to leave Bong I noticed different colored birds that were gray-brown with some pink and red coloring flocking in. I had never seen these before so quickly took photos at the feeders, not knowing what species I was taking. The sun was so bright that I couldn’t get a good view of the birds from the camera. While walking to the car I saw a couple of birders and asked if they had seen any Redpolls. They pointed in the direction of a parking lot, and said they had seen them in the evergreens and around the grounds. They also pointed out another birder who was also going to view them. I caught up to him and found out he was from Racine, Wisconsin and an avid birder who had just arrived for bird sightings. We slowly walked toward the evergreen trees and he started phishing, since no birds were seen, only heard. Immediately the birds started to move and flocked to a bare tree in front of us. They seemed to stop to stare at us. 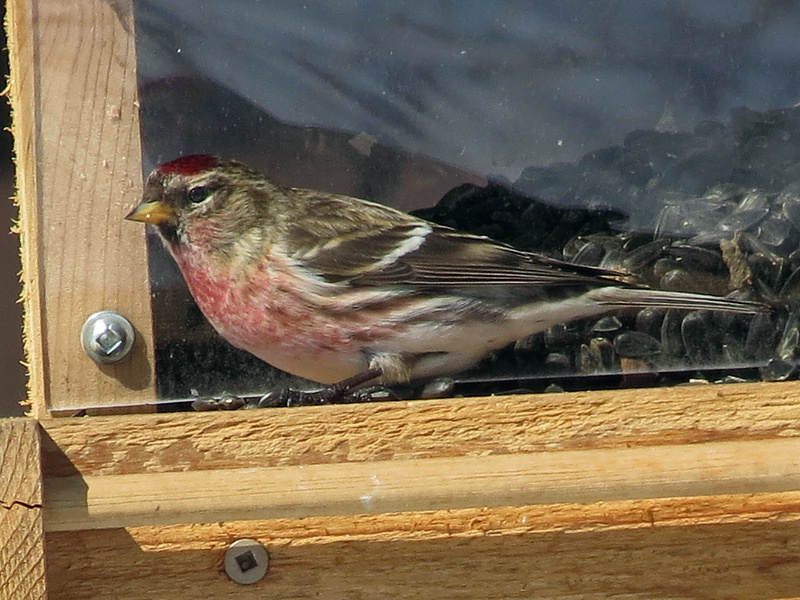 He stated these are Redpolls. 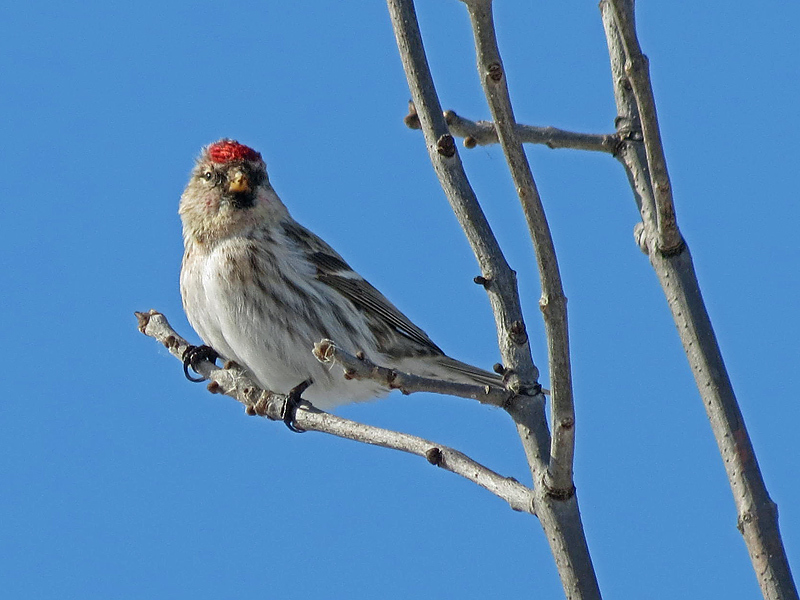 I was amazed at the Redpolls response, but immediately started taking photos. I got four photos before the flock took off as quickly as they came. After getting back home where I could view the bird photos better, it was determined that I had taken several male and one female Common Redpolls at the feeders, one female Common Redpoll, and two Hoary Redpolls from the evergreen trees. Also photographed at the feeder were a bright red male House Finch, and an orange variant House Finch. All in all it turned out to be a fairly good bird sighting and photo day, even though the best occurred in a short burst of time.